Dan Shenk-Evans ’92 characterizes his career in technology as “falling backwards” into God’s calling. For years, every position he sought in direct social ministry eventually led him reluctantly to a computer, where he would quickly solve IT problems and streamline organizational workflow. “I wasn’t sure I would find meaningful work in computer science. I thought I should be in direct service, and I tried to find a way to do that kind of work, but it wasn’t what I was best at,” said Shenk-Evans. Now director of information technologies at the Capital Area Food Bank, Shenk-Evans oversees the technological systems within a new 123,000-square-foot warehouse and office that provide food to more than 500 partner agencies, which in turn feed 478,000 people in the Washington D.C. metro area. His goal is to develop technology as a strategic asset so that more hungry adults and children can be reached. Now Shenk-Evans can tell his story of “running away from computers” with a sense of humor. In his first year of Mennonite Voluntary Service (MVS), he turned down a computer teaching position in Jamaica in favor of an agency liaison position at the Capital Area Food Bank. In the ensuing years, Shenk-Evans earned a Master’s of Divinity at Duke, which included taking a restorative justice course at EMU, and took a two-year stint as executive director of a Habitat for Humanity affiliate. There, his true aptitudes emerged. Finally, a friend pointed out that his strengths – administrative and IT experience with non-profits – would be useful at his company, Community IT Innovators. From 2000 to 2010, Shenk-Evans was a senior consultant with CITI (described further on page 12). 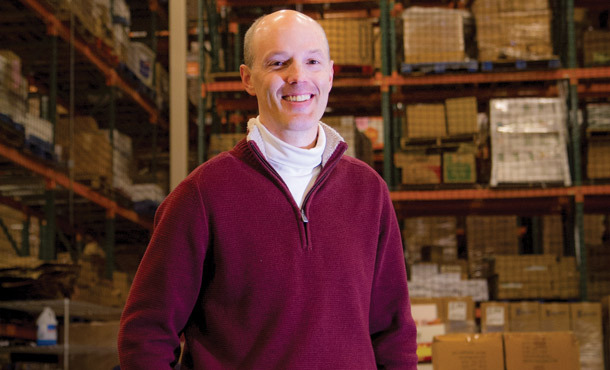 Then he returned to the Capital Area Food Bank as its first full-time IT director. Shenk-Evans now supervises a staff of three: a GIS specialist, an information systems manager, and a network administrator. For a long time, I had a narrow definition of what meaningful work was. I thought direct service was the most important way to help. Then when I tried to do it, I found out that I wasn’t very good at it. I had other skills. If you’re trying to do something that is outside your true skill set, you won’t be as effective at your work. Keep your mind and heart open to different ways to serve. Keep in mind that you’ll only be happy if you use your gifts to the good. Try to find the intersections between what the world needs, your gifts and God’s calling.